This month’s Genre has been chosen by Drew of Drew’s Movie Reviews we will be reviewing our favorite Heist Movies. My Take on it – This is a movie that I heard about years ago and have been wanting to see for a while, but just never got around to it. 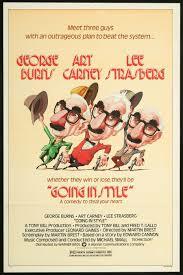 The premise seemed great and with the trio of leading men featuring Art Carney, Lee Strasberg and George Burns, how could it go wrong. Unfortunately, despite the premise with lots of potential, this movies feels like it is dampened too much and scenes that should have been funnier or even more poignant are left feeling a bit more than so-so. The storyline has its ups and downs and that actually hurts the flow of things along the way and the impact of things should have been better and more powerful. There is a planned remake next year of this film with Morgan Freeman, Michael Caine, Christopher Lloyd and Alan Arkin and despite not being a fan of remakes, I think this one actually has the potential of surpassing the original if they end up doing it right. Bottom Line – Great premise that works most of the time, but feels a bit dampened at the same time. Excellent choice of the leads help make this both funny and somber. Too many lulls in the storyline takes away from the impact that this should have. Hopefully, the remake planned for next year will take this to the level where it should be because so much can be done with it. Genre Grandeur Worthy? – Nope. It was good premise, but just doesn’t pack the power that it feels like it was meant to wield. perhaps the remake will be better next year.